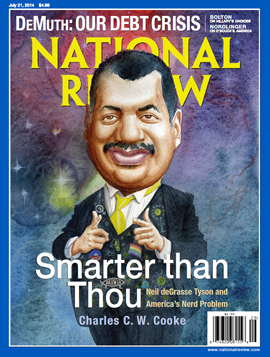 Maher holds up the new National Review cover, which explains it all. Maher tries to steer the conversation into an atheist vs theist frame, and Tyson backs him off, noting that an appreciation of the largeness and complexity of the universe, and our connection to it, is an “..almost spiritual revelation..”. Wow. The existential angst of the modestly literate “conservative” (Hell, I’m a conservative – real conservatives are no longer welcome in the anti-science crowd) – who looks around him and sees that Sara Palin, Michelle Bachman, and Louie Gohmert are all wearing the same lanyards as he is. One part insecure hipsterism, one part unwarranted condescension, the two defining characteristics of self-professed nerds are (a) the belief that one can discover all of the secrets of human experience through differential equations and (b) the unlovely tendency to presume themselves to be smarter than everybody else in the world. Prominent examples include MSNBC’s Melissa Harris-Perry, Rachel Maddow, Steve Kornacki, and Chris Hayes; Vox’s Ezra Klein, Dylan Matthews, and Matt Yglesias; the sabermetrician Nate Silver; the economist Paul Krugman; the atheist Richard Dawkins; former vice president Al Gore; celebrity scientist Bill Nye; and, really, anybody who conforms to the Left’s social and moral precepts while wearing glasses and babbling about statistics. Brewster McCracken and the Amazing Pecan Street Project sounds like a great name for a movie, – with a marvelous electric flying vehicle, maybe. Brewster McCracken is CEO of the Pecan Street Project – an Austin, Texas based research outfit that has been following the experiences of early adopter households who have upgraded to solar panels, electric cars, and smart meters. The longitudinal study is revealing a number of surprising insights into how real people use new energy technology – which I’ll be covering in future posts. I had a wide ranging Skype conversation with Brewster not long ago, much of which will make its way into new video projects – but I wanted to share a sample now. This is one whipsmart guy and one cool, informative initiative. But while the solar panels stand out–such arrays are rare in Texas–what really sets McAtee and Spoor’s home apart can’t be seen at all. Smart circuits are tracking their electricity use on a minute-by-minute and appliance-by-appliance basis, providing a running record of how power flows through their home. On his computer, McAtee opens a website that shows in near real time the rise and fall of their electricity use over the months. When Spoor opens the refrigerator to get a pitcher of lemonade, the readings spike for a moment, reflecting the extra watts consumed as the appliance compensates for the rush of warmer air. “You can literally see when a lightbulb is turned on,” says McAtee, 73, who spent years as an engineer at IBM before his retirement. My brother lives in the Methow Valley of Washington, where fires have raged in recent weeks. Despite power outages, he was able, with a neighbor, to rig pumps and keep a water sprayer on his ranch, while digging firebreaks – sufficient to avoid significant losses. As more and more Americans have these experiences first hand, Climate denial is more and more on the ropes. The President’s recent aggressive stand on climate science is the best evidence of what pollsters know – climate denial is withering under the relentless pounding of a changing natural world. Moreover, the Sierra Club’s Michael Brune notes here, that 70 percent of renewable energy is being produced in Republican congressional districts, and the messages from home on the benefits of new energy are filtering through to all but the more thick headed politicians. The Heartland Institute, famous for misinforming on the Health effects of cigarettes, and the bogus science of climate denial, now promotes the views of the creationist Discovery Institute, in attacking Science education as “propaganda”. Not a surprise to me, as, when I attended the Heartland “science” Conference in 2012, I sat thru a lecture where former astronaut “Jack” Schmitt expressed support for education bills passed in Tennessee and Louisiana, which essentially allow schools to teach religious tracts as part of the science curriculum – see above. The guidelines in question are the Next Generation Science Standards (NGSS), adopted so far by 11 states and the District of Columbia. The National Research Council, the National Science Teachers Association and the American Association for the Advancement of Science—working with 26 state governments—developed the NGSS to update K-12 science education in schools for the first time since 1998. But, because the NGSS includes material on evolution and how humans are causing climate change, it has faced opposition in some states. Most recently, the Wyoming legislature became the first in the U.S. to reject the NGSS. Lessons on climate change, lawmakers said, would brainwash kids against the state’s coal and oil industries. The non-profit National Center for Science Education (NCSE)—whose members include thousands of teachers and scientists—provides information and advice to defend quality science education at local, state, and national levels. And its advocacy on behalf of the NGSS has made it a target for both young-earth creationists and climate change deniers. And thus, a partnership is blossoming. Yesterday, the main article on the Heartland Institute website is written by the Discovery Institute’s Casey Luskin, whose ignorance of science is the stuff of legends. Critics believe that, by seeking to put a lid on scientific controversies, NCSE actually serves as an impediment to science education—such that many school systems and individual teachers refrain from teaching about the topics extensively, or avoid the topics entirely, in order to avoid the wrath of “consensus” enforcers. As a result, the nation’s schoolchildren learn neither the facts underlying the theories and counter-theories, nor the reasoning processes by which real science separates fact from fiction….NCSE has attempted not to promote good science education but to censor views with which it disagrees. News about water shortages in the American West are usually illustrated with pictures like that above, showing the decline in surface reservoirs. Now, a science team has looked below the surface. Turns out the news is worse than we thought. The impacts are increasingly being felt everywhere – bigger storms in the Midwest, soggy summers in England, drought in Colorado. But nowhere on the planet are the impacts as dramatic as the Arctic, and the ice cap is a prime example. If you’re sweltering in New York or Miami or Los Angeles, the only ice you’re probably thinking about is the stuff melting fast in your drink. 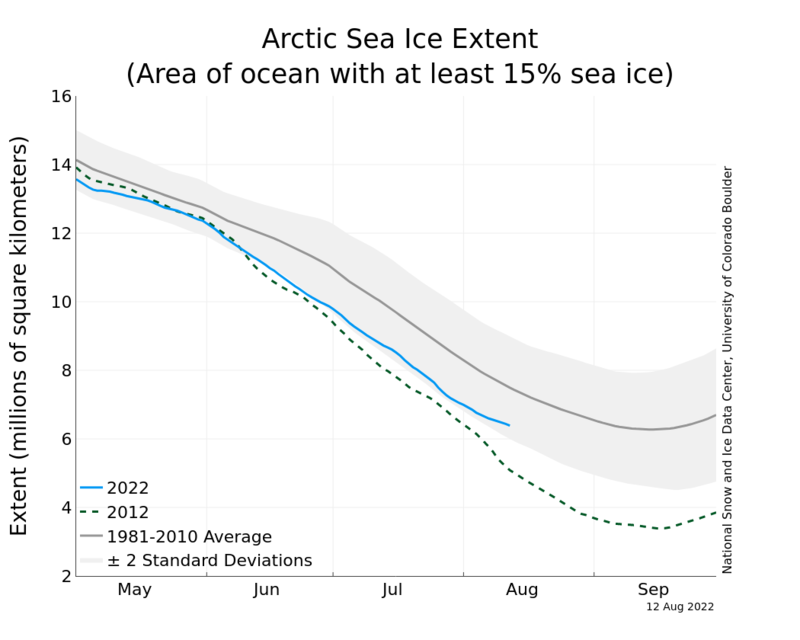 But up in the Arctic, the ice pack is on pace for another record low. Scientists won’t know for sure until mid-September, the end of the North’s melt season. But two snapshots, one from July 21, 1979, the other from July 21, 2014, show the change. Below, time lapse of Antarctic September Sea ice extent from 1979. And here, changes in Arctic (northern) sea ice during the same 1979 to 2012 period. Below, Danish maps of Arctic Ice from observations, which date from the turn of the 1900s. I’ve reported on clashes between clean energy activists and Utilities in Georgia and Arizona. Other battlefield states emerging as the solar/renewable wave moves across the country. What we’ve seen so far is that the overwhelming popularity of renewable energy has overcome big money and big clout from utilities and dirty energy advocates like ALEC and Americans for Prosperity. Look for more in the Southwest and Southeast, gradually moving northward as solar prices continue to drop. At some point, one or more states will create a solution that will become the template. Below, review Skip Pruss on the “Value of Solar” initiative that Minnesota has created. North Carolina has become one of the hottest states in America for solar power, ranking third in the nation for new photovoltaic installations in fourth quarter 2013 and first quarter 2014. But a regulatory fight pitting solar industry against big utilities is underway, and it could effectively end new utility-scale solar additions. Every two years, the North Carolina Utilities Commission reviews how it calculates the “avoided costs” (the amount utilities would have to pay to generate or buy electricity elsewhere) of clean energy. This time though, regulators are reviewing both avoided costs and the maximum size of renewable generation systems eligible for standard pricing – a regulatory process that could “have the effect of significantly reducing, if not eliminating” new solar installations in North Carolina.